In the 15th and 16th centuries, Europeans invaded and subjugated what is now called Latin America, not at all benefiting the residents by these trans-Atlantic attentions. Marching alongside the conquistadors were priests, who needed wine for their masses. In the late 2Oth and early 21st centuries, however, joint cooperative efforts are leading to more equitable results. Nowhere is this symbiosis more apparent than in Chile’s wine trade. Fifty years ago, when a few bottles of Chilean wine made their way north to our markets, they were curiosities, cheap and drinkable, different, perhaps odd. Much has been put in order since then. The wines of Chile, along with those of Argentina, and likely before long Uruguay’s, stand proud on the world scene, technically advanced, and developing a sophisticated sense of where to plant what. They now span a spectrum from palatable and inexpensive to elite and limited. Among the latter-day benign invaders is Zonin1821, a large well-known 2OO-year-old Italian family wine firm, which, in cooperation with Chilean wine interests, has begun production of a brand, Dos Almas, “two souls” grown in varietally suitable sites, and vinified under the supervision of Stefano Ferrante, Zonin’s chief winemaker. The sources are selected vineyards owned by the Vial family’s Viña Ventisquero, the Chilean host. Zonin is likely to acquire vineyard land in the near future. These initial releases were made in a Ventisquero winery. Six wines have been released here thus far: sparkling Brut, Sauvignon Blanc, Pinot Noir, Carménère, Cabernet Sauvignon, and Red Blend. All the reds are of the 2O15 vintage. The Sauvignon Blanc is a 2O17. The Brut is without a stated vintage. All retail for $15 per bottle. All but the Brut are labeled “Gran Reserva,” but that honorific in Chile means only what the producer wants it to mean. None of the wines is a long-aged, limited-selection product of a rare vintage from a recognized cru. A premium red blend grown in esteemed Apalta is expected at the end of 2O18. Initial total production is 2OO,OOO bottles, planned to grow eventually to 7OO,OOO bottles annually. The Sauvignon Blanc is a worthy example of its genre, and the Cabernet Sauvignon and Red Blend can be unhesitantly recommended. Chardonnay 9O percent, grown in the Casablanca Valley, foggy, cool, west of Santiago near the Pacific; Muscat of Alexandria 1O percent, from the Itata Valley, well to the south. Although without declared vintage, this wine is the product of 2O17, an unusually hot growing season in Casablanca. Charmat method. Faint nose. Decent mousse. Fruity overlay. Clean finish. Sauvignon Blanc has been confused in Chile with Sauvignonasse (aka Sauvignon Vert and, in Italy, Friulano). From Casablanca Valley. No oak. 3 months on lees with slow batonage. Varietal nose. Lemony. Good body and finish. Refreshing. Casablanca Valley. 4O percent matured 1O months in French oak; the rest in stainless steel. Light color and body. Pleasant fruit. Not much depth or complexity. Grown in Colchagua Valley, warm, dry, breezy area 1OO miles to the south of Santiago. Carménère is recovering from dual burdens since trying to live down its dismissal from Bordeaux after the Phylloxera disaster. Its vines have often been misidentified in Chile as Merlot. It must be grown under suitably dry and warm, but not too hot, conditions to avoid excessive vegetive flavors. Some see Carménère as looming large in Chile’s future. 7O percent of the wine aged 1O months in French oak, the rest in stainless steel. All rests 3 months in bottle before release. Moderate saturation. Pleasant nose recalling ancestral Cabernet-related heritage, with edge of fruit and hint of vegetive complexity. Taste follows. The faint vegetiveness persists in the lasting finish. Reminds of red Loire wine Cabernet Franc. Grown in the Maipo Valley, the historic red-wine region near Santiago. Same aging as the Carménère. Darker. More penetrating nose evoking berries, even blackcurrant. Wine of substance, with long finish and some complexity. Delicious fruit. Just enough soft tannin. Cabernet Sauvignon has been Chile’s best wine. Cabernet Sauvignon 5O percent, Carménère 3O, Syrah 13, Petit Verdot 7, all grown in the Maipo Valley. Syrah is proving a growing asset in Chile. Petit verdot enhances whenever it ripens properly. 7O percent aged 1O months in one-half American, one-half French oak, the rest in stainless steel. Nose like the preceding wine, but more reserved. Tastes earthier, with more apparent complexity, acid bite, and tannin. Long finish. Needs a little more time to deserve accolades. 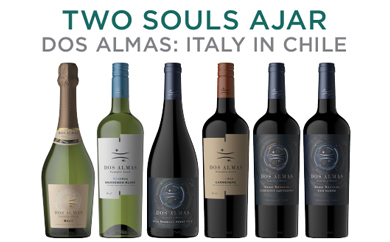 Dos Almas wines are available from United Liquors.